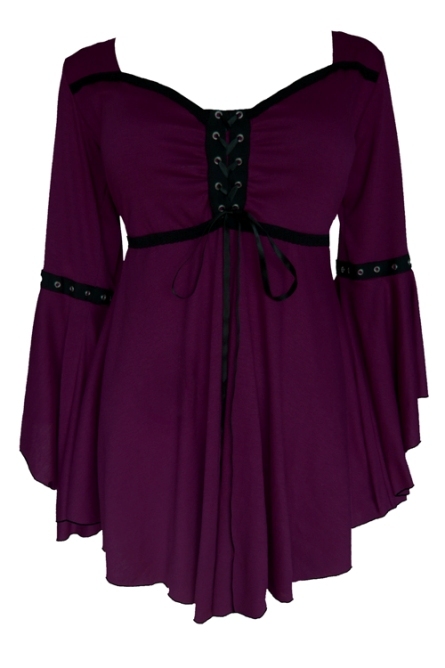 Reviews: Plus Size Gothic Ophelia Corset Top in Purple [FC34P] - $48.99 : Mystic Crypt, the most unique, hard to find items at ghoulishly great prices! This blouse is probably the most comfortable piece of clothing I own! The perk? It looks fabulous on! I am very curvy and have plenty of hips and tummy I like to cover. This blouse drapes so nicely-feels so good on and has the look and quality Jamie consistently delivers in her products. Buy two of these or three! I wish I had, and I will be buying more!